Tarpon Power Wash serves all of your commercial pressure washing needs in St Simons Island. Commercial structures of all types can be handled quickly and with little or no disruption to your business. We know that if you’re a business owner or manager, the last thing you want to deal with is having to manage a pressure washing company to make sure that they do the job right and don’t interrupt your flow of business. We understand that and that is why when you call us we do everything we can to take the hassle out of the job for you. Just let us know what you need to have done and we’ll take it from there. We’ll determine the best course of action and see that the job is done right the first time, every time. We’ll work around your business hours to make sure that we don’t interrupt your business and we are licensed and insured for your protection. Contact us today for a free estimate on commercial pressure washing! You’ll love us because we’re here to make your job easy. We know that YOU are the client and we’ll go to great lengths to see that you are happy with the process and the results that we offer. At the end of the day we want you to know exactly who to call every time you have pressure washing or soft wash needs for your business. The only way to achieve that is to make sure that you are 100% satisfied. We offer an array of solutions to be sure that your property is taken care of. We have the capability to pressure wash your building but that is not the proper solution. Just like with house washing, the best way to pressure clean a commercial building is to use the right combination of solvents and detergents to eliminate the organic growth or remove stains, followed by a thorough low pressure rinse. Concrete sidewalks and parking areas, unlike houses and buildings, do benefit from the use of high pressure cleaning. With a combination of the correct pressure washing tools and solvents, we can turn your concrete around and have it looking the way it should in no time. Our top of the line equipment is capable of heating our water to over 200 degrees to help lift oils and deep stains from your concrete. It’s not simply a matter of blasting away with high pressure at close range, so please allow us to see to it that your concrete pressure washing is done right the first time, every time. Nobody wants to deal with gum all over their sidewalks. It’s a shame that people can’t just use a trash can, but unfortunately, we just have to deal with it. Allow us to come “pop” the gum off your sidewalks and keep your business looking new. Dumpster stink! And so do dumpster pads. Let us help minimize the smell and the germs in your dumpster pads. We’ll be sure to remove the grease, rust, and general funk from your dumpster pads. 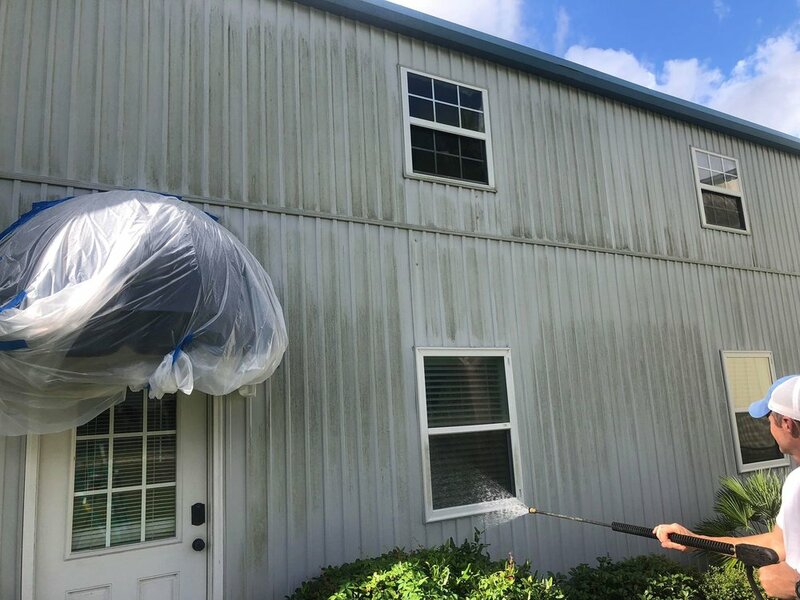 Tarpon Power Wash is a complete pressure washing company in St Simons Island GA and we understand how tough being in business can be. Let us take the headache out of hiring a commercial pressure washing company and make you a client for life. We’re easy to work with, we’re licensed and insured, and we’re the last pressure washing company you’ll ever need!